208 pages | 41 B/W Illus. Norway and Russia have been closely related through the ages, both geographically and historically, and have experienced similar problems relating to climate, building maintenance and national wooden architecture. As a result, the parallel study of architectural conservation and restoration theories and practices in both neighbouring Northern states makes for a stimulating collective monograph. 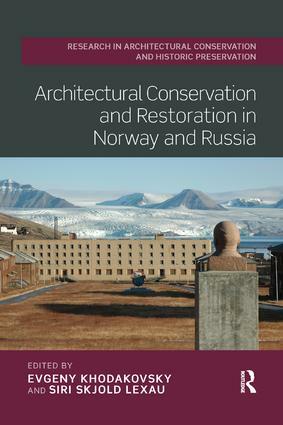 Architectural Conservation and Restoration in Norway and Russia delves into the main challenges of historic and contemporary architectural preservation practices in the two countries. The book consists of three main parts: the discovery and preservation of historical architecture in the late nineteenth to early twentieth century; contemporary approaches to former restorations and the conservation and maintenance of historical architecture; and, finally, current questions concerning preservation of twentieth-century architectural heritage which, due to different building technologies and artistic qualities, demand revised methods and historical evaluation. This is a valuable resource for academics, researchers and students in different areas of architecture (medieval, nineteenth-century, wooden and contemporary architecture) as well as in the fields of art, architectural history, cultural heritage and Scandinavian and Russian studies. Evgeny Khodakovsky is Head of the Department of Russian Art History at St Petersburg State University, Russia. Siri Skjold Lexau is Professor of Art History at the University of Bergen, Norway.